Its a decent size. Had bigger though ... and Thanks. Whenever someone posts a brief info of a review.. I think that the poster (of the info, not the reviewer) is the reviewer..
Nice review AF. 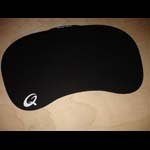 The best part of that mouse pad is that it has protection for when ever it's to be moved somewhere. Having that tin is a necessity sometime. Gamers at the LAN party will like that. That's why I didn't give that Tracer a higher score, because of no protection. Happy Modding to ya. No problem Dex, lol bilko did it too . I'm sorry Tazz, I slapped my hands for the screwup and they won't do that again. You deserve the credit for that review and it was a good review. So you can rest assured that they won't do that again. Happy Modding to ya.